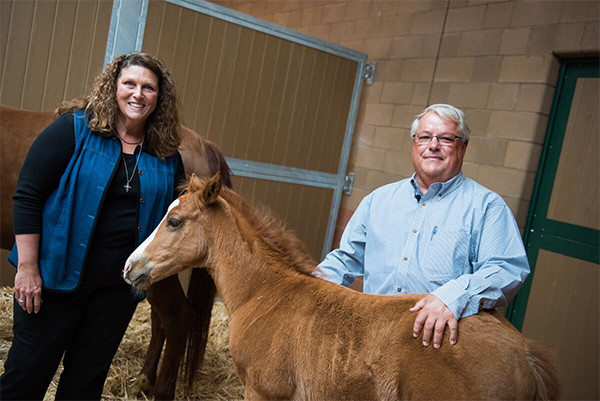 A grand opening celebration was held on June 1 to mark the completion of the ﬁrst phase of construction of the Oppenheimer Family Equine Center at Cal Poly, but the true celebration began in March when the ﬁrst foals of the season were born in the new mare barn. 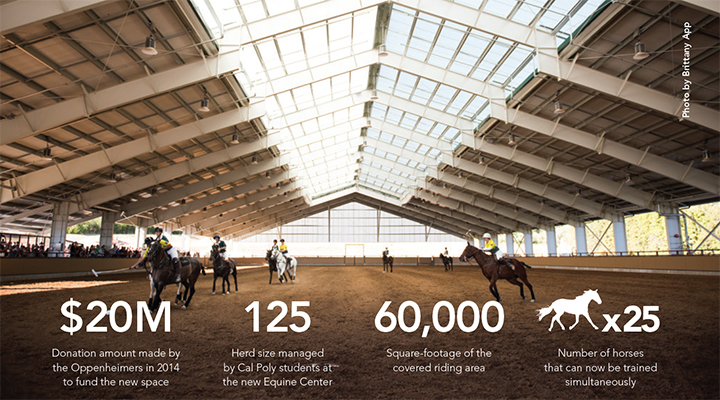 The now-complete covered riding arena, foaling barn, stallion barn and hay barn at the northern end of Cal Poly’s campus was funded by the $20 million donation made to the College of Agriculture, Food and Environ-mental Sciences from longtime Cal Poly supporters Peter and Mary Beth Oppenheimer in 2014. 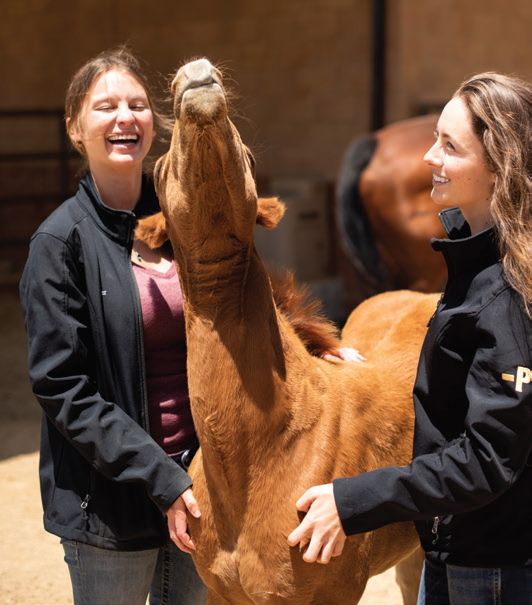 Students from across campus will benefit from the equine center, with programs including a foaling and breeding enterprise, a quarter horse enterprise, the Cal Poly Dressage Team, the Cal Poly Polo Team and the Cal Poly Equestrian Team. Peter Oppenheimer took an active role in overseeing the de-sign and construction of the new buildings, becoming a regular on the equine grounds as buildings were erected and students began to explore the new facilities. In fact, he even lent a helping hand, working alongside students to hang hooks in the new tack room and make other improvements. Mary Beth Oppenheimer worked closely with Equine Unit manager Julie Yuhas-Volk to comfortably furnish the student foaling barn lounge, which is used 24 hours a day during foaling season. Mary Beth also documented the first birth in the new barn in an iMovie featuring “Uno,” the first foal of the season born there. “We are so grateful for all that they have done for us,” said Ashlyn Frost, a senior biomedical engineering major, who comes from a cattle ranching family. There is a constant buzz on the grounds, with as many as 200 students a day using the facilities in some capacity. Cal Poly manages a herd of more than 125 horses used in its riding classes, dressage and equestrian teams, pack-horse enterprise, breeding, quarter horse and colt starting programs. Animal science seniors Giavanna Caputo and Katelyn Ingwerson managed the new, expanded mare barn, overseeing a student team responsible for tracking and caring for each of the season’s 13 foals and the mares who birthed them. During the foaling season, students staff the barn 24 hours a day — working in shared shifts to ensure the safety of the mares. “A foaling emergency can happen quick,” Ingwerson said. “If no one was here, it could be dangerous.” A new student lounge gives students a place to do school work while there. Equipped with a large-screen television, the new setup allows students to monitor each of the stalls on a continual basis and for Yuhas-Volk to immediately offer advice to students if she is offsite. The new stallion barn, where the breeding program is headquartered, also offers remote viewing access into stalls and an improved laboratory setting. Students oversee the breeding program, coordinating with veterinarians throughout the U.S. when Cal Poly mares are bred to outside stallions to embryo transfers. “The new lab offers us more and improved space, and an overall better learning environment," said David Shandley, a junior animal science major and student manager of the breeding program. The 60,000-square-foot covered riding area allows students to ride year-around, a steep improve-ment from the past when riding classes were postponed because of dangerous, muddy terrain. Students proudly showcased the arena June 2 at the annual Performance Horse Sale, the fi rst large event to be held there. Students auctioned off 20 horses, all of which were raised by students during the Quarter Horse Enterprise program. Frost managed the Quarter Horse Enterprise, spending more than 10 hours a week during the spring quarter planning for the sale. Frost said she enjoys the comrad-ery of the students, who spend up to three hours a day riding the horses they are training. The new facility allows for more training activities to occur simultaneously, working up to 25 horses at one time, she said. Ultimately Yuhas-Volk envisions expanding the Cal Poly equine program to offer more diverse classes, clinics and events. Additional facility improvements to the Oppenheimer Family Equine Center are on the horizon. A second riding arena, an Animal Health Center and an Agriculture Event Center, all funded in some part by the Oppenheimers’ donation, are in various stages of planning.